Hello everyone, and welcome to the Langrisser M Tips and Tricks Guide. This guide is designed to help you understand the mechanics of the game and give helpful tips to get your further. Langrisser M is a Mobile game based on the Langrisser series. 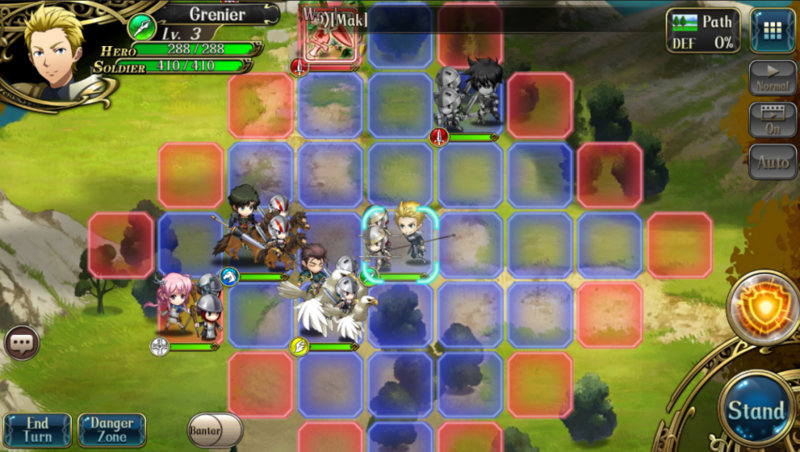 It is a grid-based strategy game similar to the likes of Fire Emblem. The game uses a grid map for its combat system. The map is made up of a series of squares that create a grid your characters move across. Each character has a movement speed which determines how many squares they can move in a turn. When a Hero is selected you tap another square to move them there. When it comes to combat the squares determine the distance between your Hero and an enemy. 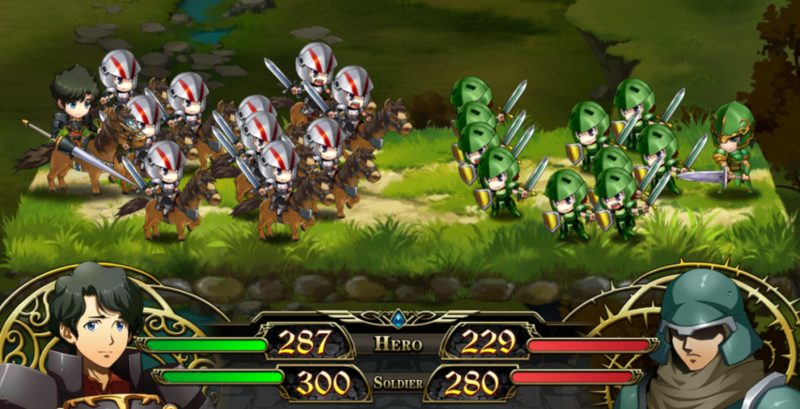 Some Heroes are close-range units and have to be right next to a unit in order to attack. Some are ranged units and can be a few squares away from a unit to attack. Attack distance determines on the Hero and what their role is. Unlike Fire Emblem where your character is a single unit, each Unit has two factors to it. There is the Hero itself and their Soldiers. Soldiers act as the Hero’s front line. They take damage first before any is dealt to the Hero then once the Soldiers are wiped out your Hero becomes the target. This changes the way you’d play normally in other grid-based games. With each attack, you have to plan out which units should attack who. With Soldiers being a defense for each Hero you’ll either want to base your attacks on wiping out the Soldiers first. Or by having a Hero that can take out both Soldiers and Heroes in one move. Some Heroes can heal while others can use powerful AoE(Area of Effect) magic. These can be important factors in a battle when it comes to the harder missions. And like most RPG games there is an element wheel. It f0llows the basic Rock, Paper, Scissors method where one element is strong to one but weak to another. Langrisser M is a Hero collector game where you summon characters with a currency. 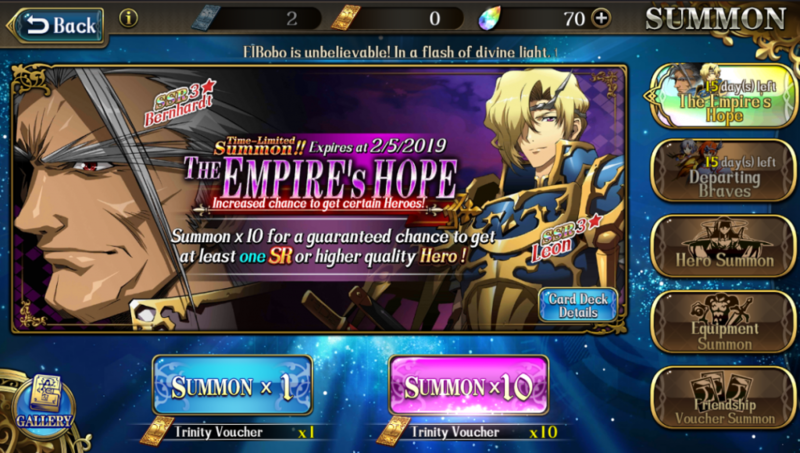 The summons are random and the characters you get are based on the banner they come with. To summon heroes you either need Trinity Vouchers which can be bought with the in-game currency Trinity Crystals. Or Friendship Vouchers which are items you get through playing the game. You’ll get a few Heroes through the tutorial. Summoning also takes a bit of time because of the RNG factor making it harder to get the really rare and powerful heroes. Having so many Heroes in the game gives a lot of variety in terms of team composition. You can build a team of your favorite characters or one that’s built to work well based on unit types. You can level up your Heroes through special potions that can be fed to them. As well as changing their Equipment, Soldiers, etc. Heroes can also be upgraded with special items that can be gotten throughout the game. But a lot of the Hero management isn’t unlocked until later chapters in the game are completed. Being a strategy game that focuses on parties the most important thing you can focus on is team comp. You want to have a team that can work well together and withstands powerful enemy units without much trouble. 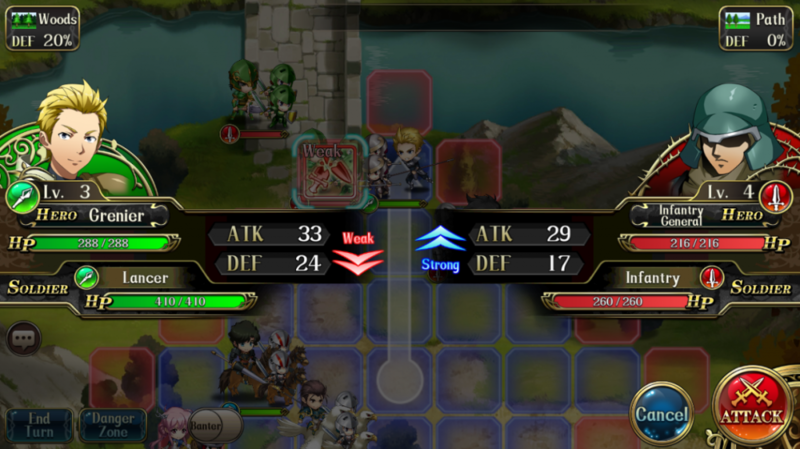 Filling a team with nothing but close-range damage units will get you nowhere. You need attackers to dish out damage but you need healers and support units to help out. Building a team should be based on how effective they’ll be in an overall fight. Making a team of your favorite characters is fine but paying attention to how to build that team is important too. Healers are a must in every team. At least having one healer on the team is something that should be a requirement to everyone when they play. When it comes to the damage dealers you can focus close or long range depending on your personal play style. It’s good to have both to cover more ground. Another thing to note when in combat is paying attention to the character’s Attack and Defense. Each unit has both an ATK and DEF value to their name. If your unit has a Strong attack over your enemies then it’s a good move to make. 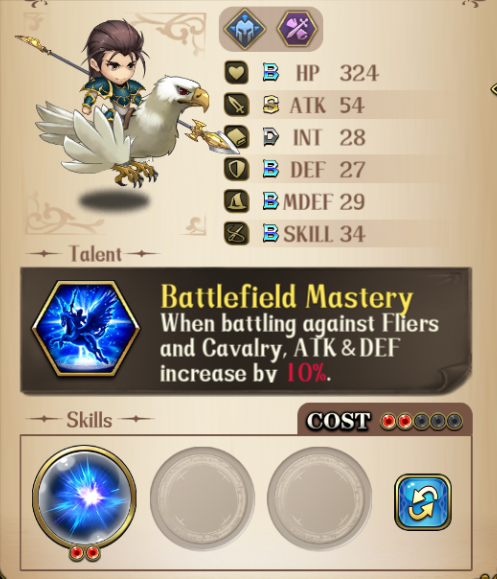 But if your unit has a Weak marker instead you should probably have them focus on another unit. This can be the difference between winning or losing a fight. If you don’t pay attention to this you could lose a unit in a fight and start finding yourself on the decline very quickly.